In this issue of the Blood-Letter: a preview of our March guest, Lisa Alber, awards, and more! Lisa Alber is the recipient of an Elizabeth George Foundation writing grant and a Walden Fellowship, both of which she received based on early drafts of Kilmoon, her debut mystery. Her short story, “Paddy O’Grady’s Thigh” appeared in Two of the Deadliest (Harper Collins), an anthology edited by Elizabeth George. In addition, Lisa was nominated for a Pushcart Prize for the story “Eileen and the Rock”. 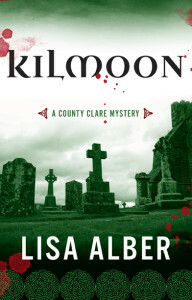 Kilmoon was nominated for a Left Coast Crime Rosebud Award for best first novel. The novel is the first in a series and features a matchmaker with a dark past, his long-lost daughter, and a conflicted detective. Before becoming a published author, Lisa worked in international finance and book publishing. Ever distractible, you may find Lisa staring out windows, dog walking, or drinking red wine with friends. Travel, reading, animals, photography, and blogging round out her distractions. You can find her online at www.lisaalber.com. She will be speaking about her unlikely journey toward publication, inspirations for Kilmoon, and how New York Times bestselling author Elizabeth George helped her become a better writer. We are looking forward to hearing Lisa’s presentation – we hope you will be able to join us. The program will begin at 7:30 pm at Terwilliger Plaza. Directional signs will be posted in the building. The meeting is free and open to the public. Free parking is available in the Terwilliger Plaza employee parking lots across 6th Avenue from the lower level entrance, and on Sheridan Street. Tri-Met bus #8, Jackson Park, stops just in front of the lower level entrance. This year’s Left Coast Crime Conference was held at the Doubletree Hilton in Portland, Oregon. The awards, voted on by attendees of LCC, were presented on March 14, 2015. Congratulations to those who were responsible for planning and bringing “Crimelandia” to Portland — it was a big success!!! The Mystery Writers of America have announced their nominees for the 2015 Edgar Allan Poe Awards. The awards will be presented to the winners on April 29, 2015 in New York City. For a complete list of nominees in all categories go to www.mysterywriters.org. And, for those of you who prefer more “traditional mysteries” here are some of the Agatha Award nominations, which will be announced at the Malice Domestic Conference, in Bethesda, Maryland, from May 1-3, 2015. For a complete list of nominees in other categories you can go to www.malicedomestic.org. Look for our Spotted Owl Award winners in the next issue of The Blood-Letter.